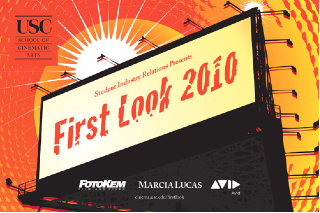 Avid is proud to partner with USC's School of Cinematic Arts for the 2010 First Look Film Festival, running April 17-27 in Los Angeles. For more than a decade, the First Look festival has introduced the newest generation of filmmakers to the professional film community, and this year, 37 student films are competing in categories such as Cinematography, Documentary, Writing, Editing, Sound, Directing and Producing. As part of the discussion series following the initial film screenings, Avid is hosting a presentation on the future of post-production, including a discussion with editor Chris Nelson and sound re-recording mixers Frank Marone and Scott Weber from ABC's Lost, now in its sixth and final season. There will also be a special drawing for prizes from Avid. For more information on the festival or the discussion series, click on the link above!